Active is the new range by Elbeo, designed for women who need support for work or travel. Designed for the younger entrepreneur or the world traveler, Elbeo Active knee highs are perfect for offering a great deal of support, but only near the ankles and the feet. This makes them perfect for women who are on their feet all day, walking from one meeting to the next or on their travels. It is perfect for a busy lifestyle and will keep your feet feeling good as new, no matter the footwear or the miles you might do. Rating: 5 I like them very much: just what I’d hoped, but it would be great not to have to handwash! Rating: 5 Think this is the 2nd or 3rd occasion that I have purchased these. Really like the firm supported and the fact that they are opaque. Would be great to see these in a range of fashionable colours. Support hosiery is generally limited in choice so I need to stock up when I find something that works for me. Rating: 5 Love these and so upset to find out that they are to be discontinued. Rating: 5 These knee highs are probably not very glamorous but they are warm, hard wearing and very comfortable. The added bonus of and excellent price and service from UK Tights is just wonderful. Rating: 5 These are just wonderful, they are warm and comfortable. Hard wearing and provide great support. Great price from this site. Rating: 4 It is a pity that there is a raised seam in the toe, but otherwise they are very comfortable. Rating: 5 Wonderful knee highs which I have longed for for years. They are supportive, attractive and hard wearing. Hopefully they won't be discontinued especially as they are hard wearing. Rating: 5 I'm very pleased with these knee highs, good quality, reasonably priced, wash well and give good support. Rating: 5 These work well for me, I have been using them for about 2 years and they help with swollen ankles and veins. Rating: 5 Lovely to find opaque support hosiery. Good fit and support whilst comfortable to wear. Rating: 5 Really great to find opaque support knee highs that are comfortable to wear and also look good. I have been looking for this type of product for a long time as a large retailer that supplied own brand support opaque hosiery stopped stocking them. It would be lovely to see them in some other colours such as navy and dark brown. I have worn support hosiery for many years after suffering from a DVT and have always struggled to find products that are fashionable and of an attractive appearance. 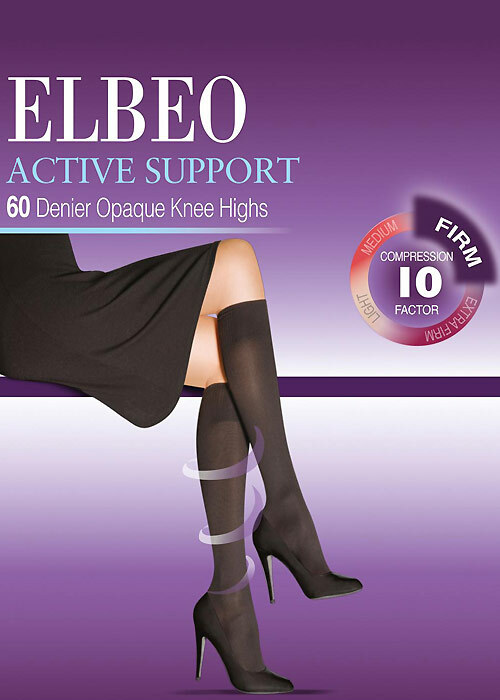 Rating: 5 Great product.I have been longing for some comfortable support knee highs for years and have had to put up with ones which cramp my toes and are not firm enough.I only hope Elbeo continue with them indefinitely. 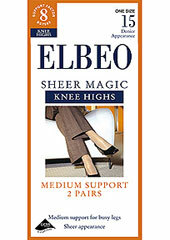 Rating: 5 Brought these for my partner for support due to ankle knee problems and she loves them. Rating: 5 Excellent quality product. Support is firm without feeling excessively tight and the quality of the fabric is superb. I particularly like being able to buy the larger size for my size 8 feet. This is my first pair of Elbe knee highs and I am impressed. They are far better than any of the support knee highs I have bought from the high street retailers including M&S and Boots. It would be great to see a medium support option in the same opaque style. If you're looking for a good quality support knee high, look no further. I'm definitely going to be ordering more. Highly recommended.